From its market hunting roots to a modern Canada goose boom, the Bay endures as a waterfowl mecca. The anchor thudded against the deck as lines ran through the blocks. The ship creaked and groaned as its sails unfurled. Below deck slept hunters from Philadelphia, New York or Washington -- perhaps even President Grover Cleveland, who frequented the Susquehanna Flats from 1885 to 1897. After a 3 a.m. stop at the starting line between the Havre de Grace Lighthouse and Carpenters Point's light, all of the ships slid out onto the Flats by 3:15 a.m., carrying heavy sinkboxes and hundreds of decoys. Chesapeake Bay was discovered by the first explorers of the new world, and this, America's largest estuary, held all manner of fish, succulent blue crabs, oysters and abundant waterfowl. By the time President Cleveland hunted the Susquehanna Flats, the canvasback was king, and had become the signature duck of Chesapeake Bay. Plump and delicious to eat, enormous rafts of canvasbacks wintered near the head of The Bay, providing gunning for the privileged and locals alike. Hunting the Flats was a combination of ceremony, sport and plain hard work. The sinkbox that was indigenous to hunting the Flats until they were outlawed in the 1920s, was ferried to the hunting grounds aboard a much larger sailing ship. Once at a prime location, the box went overboard to be anchored with the wind at the hunters' backs. With the sinkbox in place, up to 300 canvasback decoys were set around it. Lying off half a mile or more, small tender boats rowed the hunters to and from the box and retrieved downed ducks. Every box carried a red flag that was waved to summon the tender when the hunters were either frozen to the bone or the box was taking on water and threatening to sink. The harvest of ducks was intense on good days, and like now, slim when the birds didn't fly. The abundance of waterfowl, fish, oysters and blue crabs The Bay routinely gave up made it a land of plenty. The era gave rise to the Waterman -- tough men who made their livings and provided for their families from the bounty of The Bay. Like their counterparts elsewhere, they believed God laid these riches at their feet for their use, even though their use was frequently in conflict with the law. Fishing, crabbing, oystering and waterfowl were their living. Many on the Upper Bay guided hunters, but the majority hunted for the market. An old shipping list shows the wholesale value for a prime pair of canvasbacks was $5 to $7, regular cans $2.50 to $5. Redheads brought $2.50 a pair, while a pair of geese only brought $2. A dozen king rails brought the Waterman 70 cents to a dollar, and blackbirds fetched 25 to 75 cents a dozen. Trains regularly stopped at Havre de Grace, and iced ducks and yes, even blackbirds, would be delivered to markets in the Northeast within hours. The burgeoning immigrant populations along the east coast needed protein, and many families fed on blackbird pie. Ducks went to the more affluent. Night hunting, multiple-barrel guns and huge punt guns were legal, but that ended at the end of the 19th century, everywhere but on Chesapeake Bay, where outlaw hunting persisted well into the middle of the 20th century. It's one of The Bay's legends. Today, many hunters pride themselves on how many ducks they shoot in a season, but no one can equal the late Atley Lankford of Elliott Island, Md., who killed more than 35,000 ducks with his Remington 11 semi-auto. Gunning for the market from 1900 until 1918, Lankford's challenge in shooting 200 birds a day was not ammunition, but physically carrying the ducks from the marsh. Lankford averaged more than 10,000 ducks a year, and his lifetime total was nearly half a million ducks. Until 1910, when he bought his Remington 11, Lankford wore out a shotgun every year. He was able to shoot the venerable Model 11 for eight years, although he had to replace the fore-end every year. Hundreds of gunners such as Lankford worked along the Bay's shore and islands. Demand for ducks and geese for the market, however illegal, was high. These hearty souls used many techniques, but none as deadly as night gunning. Night gunning took many forms, but none as deadly often, too, for the hunter should he capsize in frigid water, as a scull boat with a bow-mounted night light. A kerosene lamp within a highly polished reflector would illuminate resting flocks of ducks and geese, and had a mesmerizing affect on the birds. The low-rise boat was difficult for the birds to silhouette against the sky, and a stealthy paddler could slide almost into the flock. Some used a multi-barreled gun, others a large punt gun loaded with a pound of shot or nails, while others used a semi-auto like Lankford's Remington 11 with an 11-shot extension magazine. They simply begin shooting the flock on the water, taking as many as possible as the ducks balled up while taking off. The kills were often massive, all to provide black-market ducks and geese for restaurants, clubs and housewives in Baltimore, Philadelphia, New York and Washington. The Lacy Act, enacted into law in 1900, made market gunning illegal, but old habits died hard. The last of the punt guns was not rounded up until the 1960s, and market gunning persisted well into the 1950s. As the age of the market gunner slipped into history, the whole of Chesapeake Bay changed. The mouth of The Bay empties into the Atlantic and runs from pure salt water at Cape Charles on the tip of the Virginia appendix to fresh water at Havre de Grace. However, as nature runs cycles from wet to drought, the salinity of the bay varies day to day. Increased agriculture and the consequent use of chemicals and fertilizers all changed the composition of The Bay. But the greatest change came in the form of a fowl -- the humble chicken. The DelMarVa Peninsula, the conglomerate of Delaware, Maryland and Virginia that makes up The Eastern Shore, is an ideal place to raise poultry. In the 1960s, farming of corn, soybeans and wheat increased to feed millions of hungry poults. With the chickens came the Canada geese. ains fields, and the Atlantic Flock of Canada geese took up residence throughout The Bay. The influx of geese ushered in The Bay's golden age of goose hunting. Calling was not a part of the equation when hunting The Bay. Geese would come to decoys, just like the ducks. Those who hunted the marshes, cuts and ponds used duck calls, but not very well, at least compared to their brothers in Arkansas and elsewhere in the Mississippi Flyway. Now, with geese beginning to cover The Bay, calling became an issue. One early outfitter brought a group of Cree Indians from James Bay to call for clients. Some guides began using Olt 88 goose calls with the reed shoved back into the call to enable a rapid-fire style that began to define Bay-style calling. As goose calling evolved, a young, recent college graduate, Sean Mann, whose father ran a gun shop in Easton, Md., grew up around the guides who came into his father's shop. Fascinated with calling, he began to work with calls. By 1984, he had developed his trademark Eastern Shoremann call, with which he won the 1985 World Goose Calling Championship. The heyday of goose hunting lasted from the 1960s until the mid 1990s. The seasons ran 90 days, with a daily limit of three Canada geese. Guiding services often had more than 100 hunters daily for a three-day hunt. Lease and hunting land costs skyrocketed. Pickers were in demand, processing hundreds of geese daily. Motels were filled, restaurants crowded and gun shops sold bales of clothing and pallets of ammunition. So it went for nearly 30 years. Gradually, the flock thinned. There seemed to be as many geese, but they were in concentrated groups. While it would be easy to suggest overhunting was the culprit -- by the late 1980s many outfitters had begun questioning the three-bird limit as excessive -- but several years of continuous poor weather on the breeding grounds was the real reason for the diminishing Atlantic flock. The Atlantic flock breeds on the Ungava Peninsula -- the northernmost nesting area of any Canada goose flock. Nesting on these grounds is a close-run affair. A late snowstorm, a late thaw with flooding or other weather-related phenomena can decimate nests. Only 10 to 15 percent of breeding pairs of Canada geese re-nest if their nests are destroyed. Of those, only a fraction produce a clutch of chicks, and only 25 to 30 percent of them typically survive. So while it would be easy to blame overharvest, the problem really is more than 1,000 miles north of The Bay. When the migratory flock of geese began to thin dangerously, the season was shortened and the bag limit reduced from three a day to one daily for the first part of the season, then two for the remainder. The limit finally dropped to one bird a day for 30 days. In 1995, the migratory goose season was closed to allow the flock to rebuild to a safe 300,000-goose threshold. Initially instituted as a three-year moratorium, it ultimately extended to seven seasons. During that time, the flock rebuilt through several contiguous good breeding seasons. When the moratorium was lifted in 2001, the migratory population was so large that when asked how many geese were in Maryland, Larry Hindman, Maryland's chief waterfowl biologist, simply said, "Lots." Goose hunting has returned, not as it was when it was a multi-million-dollar industry, but as a newly reborn Mecca for waterfowl hunters. During the 2007-2008 season, Canada goose season extended 60 days with a two-bird daily limit. And yes, there are a lot of birds. Maryland used to offer a unique style of goose hunting: over water. In the 1970s and 1980s, when crossing the three-mile-long Chesapeake Bay Bridge that connects Annapolis, Md., with the Eastern Shore, large water blinds dotted the shore and out into The Bay. Today, there are none. Goose hunting is done from pits in grain fields, which is far more productive and abundantly safer. Many waterfowlers hunt the creeks and rivers for ducks and geese, but most hunting out on The Bay today targets sea ducks and divers. Sea ducks, mainly scoters and long-tailed ducks, along with scaup, redheads and canvasbacks are hunted off shore. The favorite hunting style is to use a large boat, set the decoys to bring the ducks close, then fish for rock fish or stripers until the ducks start to work. Some are now hunting from layout boats, which is even more fun. Lying just above water level, the ducks bore in right on the deck, seemingly at eye level. As they set their short wings, the hunter rises for the shot. A tender boat waits several hundred yards away -- just as in the halcyon days of gunning the Susquehanna Flats for canvasbacks -- and comes quick to change shooters and pick up the bagged ducks. Chesapeake Bay is facing tough challenges because of increased growth of aquatic vegetation, sewage dumping and chemicals. Moves are afoot to inject money for the restoration of The Bay, but Congress moves slowly, and state monies are in short supply, so restoration is still dollars and time away. However, Chesapeake Bay will endure. 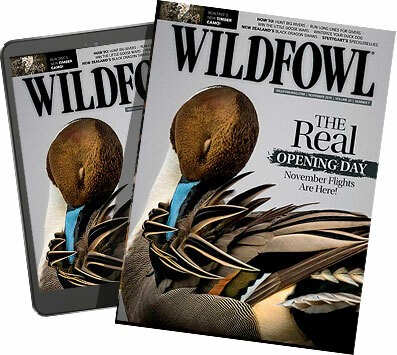 It will continue to provide the abundance of sport that was once a livelihood to many, and is now enjoyed by all, whether it is hunting or just observing the ospreys, bald eagles, ducks and huge flocks of Canada geese that are emblematic of one of America's most historic shrines of wildfowling. John Taylor is an avid waterfowl hunter from Virginia, near the Chesapeake Bay.